Jinny Marsh’s Hot Kugel Klezmer Band brings together the hottest musicians in the Washington area playing a variety of Klezmer, Yiddish, Chassidic, and Israeli dance tunes, classical music, American standards and Broadway. We offer violin, clarinet, piano, trombone, bass, drums, guitar, and vocals. 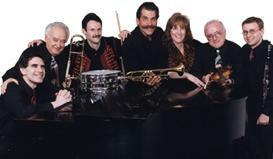 See the performance of Jinny Marsh’s Hot Kugel Klezmer Band at the Kennedy Center. Based in Washington DC, the band performs for Jewish community events and has been featured at the Kennedy Center, the Smithsonian and the Library of Congress. The group has delighted audiences at the National Folk Festival in East Lansing, Michigan and at the Lowell Folk Festival in Massachusetts.